"psitta" redirects here. For the suffix "-psitta" as used in taxonomy, see List of commonly used taxonomic affixes. The Peshitta (Syriac: ܦܫܝܛܬܐ‎ pšîṭtâ) is the standard version of the Bible for churches in the Syriac tradition. The general, but not universal, consensus among Bible scholars is that the Old Testament of the Peshitta was translated into Syriac from the Hebrew, probably in the 2nd century AD, and that the New Testament of the Peshitta was translated from the Greek. This New Testament, originally excluding certain disputed books (2 Peter, 2 John, 3 John, Jude, Revelation), had become a standard by the early 5th century. The five excluded books were added in the Harklean Version (616 AD) of Thomas of Harqel. However, the 1905 United Bible Society Peshitta used new editions prepared by the Irish Syriacist John Gwynn for the missing books. The name 'Peshitta' is derived from the Syriac mappaqtâ pšîṭtâ (ܡܦܩܬܐ ܦܫܝܛܬܐ), literally meaning 'simple version'. However, it is also possible to translate pšîṭtâ as 'common' (that is, for all people), or 'straight', as well as the usual translation as 'simple'. Syriac is a dialect, or group of dialects, of Eastern Aramaic, originating in Northern Mesopotamia and around Edessa. It is written in the Syriac alphabet, and is transliterated into the Latin script in a number of ways: Peshitta, Peshittâ, Pshitta, Pšittâ, Pshitto, Fshitto. All of these are acceptable, but 'Peshitta' is the most conventional spelling in English. There is no full and clear knowledge of the circumstances under which the Peshitta was produced and came into circulation. Whereas the authorship of the Latin Vulgate has never been in dispute, almost every assertion regarding the authorship of the Peshitta and its time and place of its origin, is subject to question. The chief ground of analogy between the Vulgate and the Peshitta is that both came into existence as the result of a revision. This, indeed, has been strenuously denied, but since Dr. Hort in his Introduction to Westcott and Hort's New Testament in the Original Greek, following Griesbach and Hug at the beginning of the 19th century, maintained this view, it has gained many adherents. As far as the Gospels and other New Testament books are concerned, there is evidence in favor of this view, which has been added to by recent discoveries; and fresh investigation in the field of Syriac scholarship has raised it to a high degree of probability. The very designation, "Peshito," has given rise to dispute. It has been applied to the Syriac as the version in common use, and regarded as equivalent to the Greek koiné and the Latin Vulgate. The word itself is a feminine form, meaning "simple", as in "easy to be understood". It seems to have been used to distinguish the version from others which are encumbered with marks and signs in the nature of a critical apparatus. However, the term as a designation of the version has not been found in any Syriac author earlier than the 9th or 10th century. As regards the Old Testament, the antiquity of the version is admitted on all hands. The tradition, however, that part of it was translated from Hebrew into Syriac for the benefit of Hiram in the days of Solomon is surely a myth. That a translation was made by a priest named Assa, or Ezra, whom the king of Assyria sent to Samaria, to instruct the Assyrian colonists mentioned in 2 Kings 17, is equally legendary. That the translation of the Old Testament and New Testament was made in connection with the visit of Thaddaeus to Abgar at Edessa belongs also to unreliable tradition. Mark has even been credited in ancient Syriac tradition with translating his own Gospel (written in Latin, according to this account) and the other books of the New Testament into Syriac. 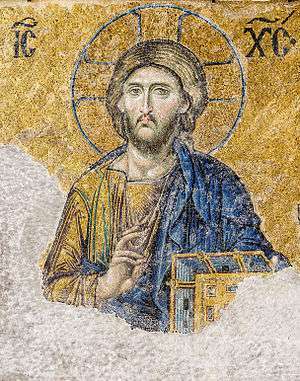 But what Theodore of Mopsuestia says of the Old Testament is true of both: "These Scriptures were translated into the tongue of the Syriacs by someone indeed at some time, but who on earth this was has not been made known down to our day". F. Crawford Burkitt concluded that the translation of the Old Testament was probably the work of Jews, of whom there was a colony in Edessa about the commencement of the Christian era. The older view was that the translators were Christians, and that the work was done late in the 1st century or early in the 2nd. The Old Testament known to the early Syrian church was substantially that of the Palestinian Jews. It contained the same number of books but it arranged them in a different order. First there was the Pentateuch, then Job, Joshua, Judges, 1 and 2 Samuel, 1 and 2 Kings, 1 and 2 Chronicles, Psalms, Proverbs, Ecclesiastes, Ruth, the Song of Songs, Esther, Ezra, Nehemiah, Isaiah followed by the Twelve Minor Prophets, Jeremiah and Lamentations, Ezekiel, and Daniel. Most of the apocryphal books of the Old Testament are found in the Syriac, and the Wisdom of Sirach is held to have been translated from the Hebrew and not from the Septuagint. If we could accept the somewhat obscure statement of Eusebius that Hegesippus "made some quotations from the Gospel according to the Hebrews and from the Syriac Gospel," we should have a reference to a Syriac New Testament as early as 160–180 AD, the time of that Hebrew Christian writer. One thing is certain, that the earliest New Testament of the Syriac church lacked not only the Antilegomena – 2 Peter, 2 and 3 John, Jude, and the Apocalypse – but the whole of the Catholic Epistles. These were at a later date translated and received into the Syriac Canon of the New Testament, but the quotations of the early Syrian Fathers take no notice of these New Testament books. The Curetonian consists of fragments of the Gospels brought in 1842 from the Nitrian Desert in Egypt and now in the British Museum. The fragments were examined by Canon Cureton of Westminster and edited by him in 1858. The manuscript from which the fragments have come appears to belong to the 5th century, but scholars believe the text itself to be as old as the 100s AD. In this recension the Gospel according to Matthew has the title Evangelion da-Mepharreshe, which will be explained in the next section. The Diatessaron is the work which Eusebius ascribes to Tatian, an early Christian author considered by some to have been a heretic. Eusebius called it that "combination and collection of the Gospels, I know not how, to which he gave the title Diatessaron." (Ecclesiastical History book 4, 29:6) It is the earliest harmony of the Four Gospels known to us. Its existence is amply attested in the churches of Mesopotamia and Syria, but it had disappeared for centuries, and not a single copy of the Syriac work survives. Although no copy of the Diatessaron has survived, the general features of Tatian's Syriac work can be gathered from these materials. It is still a matter of dispute whether Tatian composed his Harmony out of a Syriac version already made, or composed it first in Greek and then translated it into Syriac. But the existence and widespread use of a Harmony, combining in one all four Gospels, from such an early period (172 AD), enables us to understand the title Evangelion da-Mepharreshe. It means "the Gospel of the Separated," and points to the existence of single Gospels, Matthew, Mark, Luke, John, in Syriac, in contradistinction to Tatian's Harmony. Theodoret, bishop of Cyrrhus in the 5th century, tells how he found more than 200 copies of the Diatessaron held in honor in his diocese and how he collected them, and put them out of the way, associated as they were with the name of a heretic, and substituted for them the Gospels of the four evangelists in their separate forms. The Peshitta version of the Old Testament is an independent translation based largely on a Hebrew text similar to the Proto-Masoretic Text. It shows a number of linguistic and exegetical similarities to the Targumim but is now no longer thought to derive from them. In some passages the translators have clearly used the Greek Septuagint. The influence of the Septuagint is particularly strong in Isaiah and the Psalms, probably due to their use in the liturgy. Most of the Deuterocanonicals are translated from the Septuagint, and the translation of Sirach was based on a Hebrew text. [BIBLE. N.T. Revelation. Polyglot.] Gelyānā ude-Yoḥanan qaddīsha, id est, Apocalypsis Sancti Iohannis. — Lugduni Batavorum : Ex Typ. Elzeviriana, 1627. Mosul edition, published in 1888–1892 by Clement Joseph David  and by Mar Georges Ebed-Iesu Khayyath for the Dominican mission. This edition, differently from previously editions, includes also some books not in the Hebrew Bible but found in many Peshitta manuscripts: these books included are: Tobit, Judith, Additions to Esther, Wisdom (of Solomon), Sirach, Letter of Jeremiah, Baruch, Bel and the Dragon, Susanna, 1 Maccabees, 2 Maccabees, 2 Baruch with the Letter of Baruch. Almost all Syriac scholars agree that the Peshitta gospels are translations of the Greek originals. A minority viewpoint, variants of an Aramaic original New Testament hypothesis, is that the Aramaic New Testament of the Peshitta represents the original New Testament and the Greek is a translation of it. The type of text represented by Peshitta is the Byzantine. In a detailed examination of Matthew 1–14, Gwilliam found that the Peshitta agrees with the Textus Receptus only 108 times and with Codex Vaticanus 65 times, while in 137 instances it differs from both, usually with the support of the Old Syriac and the Old Latin, in 31 instances is stands alone. In the first century AD, Josephus, the Jewish priest, testified that Aramaic was widely spoken and understood accurately by Parthians, Babylonians, the remotest Arabians, and those of his nation beyond Euphrates with Adiabeni. For Example, Josephus points out how people from what are now Iran, Iraq, and remote parts of the Arabian Peninsula knew "accurately" about the war of the Jews against the Romans due to the books he wrote "in the language of our country", books which he then translated into Greek for the benefit of the Greeks and Romans (see quote below). Jewish Wars (Book 1, Preface, Paragraph 1)(1:3)- "I have proposed to myself, for the sake of such as live under the government of the Romans, to translate those books into the Greek tongue, which I formerly composed in the language of our country, and sent to the Upper Barbarians. Joseph, the son of Matthias, by birth a Hebrew, a priest also, and one who at first fought against the Romans myself, and was forced to be present at what was done afterwards, [am the author of this work]." Jewish Wars (Book 1 Preface, Paragraph 2) (1:6)- "I thought it therefore an absurd thing to see the truth falsified in affairs of such great consequence, and to take no notice of it; but to suffer those Greeks and Romans that were not in the wars to be ignorant of these things, and to read either flatteries or fictions, while the Parthians, and the Babylonians, and the remotest Arabians, and those of our nation beyond Euphrates, with the Adiabeni, by my means, knew accurately both whence the war begun, what miseries it brought upon us, and after what manner it ended." Dead Sea Scrolls Archaeologist Yigael Yadin also agrees with Josephus' testimony, pointing out that Aramaic was the lingua franca of this time period (Source - Book "Bar Kokhba: The rediscovery of the legendary hero of the last Jewish Revolt Against Imperial Rome" Page 234). The testimony of Josephus about Aramaic being "accurately understood" is also supported by New Testament (Matthew 4:24-25, Mark 3:7-8, Luke 6:17) where people from Galilee, Judaea, Jerusalem, Idumaea, Tyre, Sidon, Syria, Decapolis, and from beyond Jordan came to see Jesus for healing and to hear his discourse. The standard United Bible Societies 1905 edition of the New Testament of the Peshitta was based on editions prepared by Syriacists Philip E. Pusey (d.1880), George Gwilliam (d.1914) and John Gwyn. These editions comprised Gwilliam & Pusey's 1901 critical edition of the Gospels, Gwilliam's critical edition of Acts, Gwilliam & Pinkerton's critical edition of Paul's Epistles and John Gwynn's critical edition of the General Epistles and later Revelation. This critical Peshitta text is based on a collation of more than seventy Peshitta and a few other Aramaic manuscripts. All twenty seven books of the common western canon of the New Testament are included in this British & Foreign Bible Society's 1905 Peshitta edition, as is the adultery pericope (John 7:53–8:11). The 1979 Syriac Bible, United Bible Society, uses the same text for its New Testament. The Online Bible reproduces the 1905 Syriac Peshitta NT in Hebrew characters. James Murdock- The New Testament, Or, The Book of the Holy Gospel of Our Lord and God, Jesus the Messiah (1851). John Wesley Etheridge- A Literal Translation of the Four Gospels From the Peschito, or Ancient Syriac and The Apostolical Acts and Epistles From the Peschito, or Ancient Syriac: To Which Are Added, the Remaining Epistles and The Book of Revelation, After a Later Syriac Text (1849). George M. Lamsa- The Holy Bible From the Ancient Eastern Text (1933)- Contains both the Old and New Testaments according to the Peshitta text. This translation is better known as the Lamsa Bible. He also wrote several other books on the Peshitta and Aramaic Primacy such as Gospel Light, New Testament Origin, and Idioms of the Bible, along with a New Testament commentary. Several well-known evangelists used or endorsed the Lamsa Bible, such as Oral Roberts, Billy Graham, and William M. Branham. 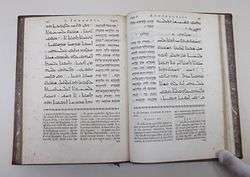 Andrew Gabriel Roth- Aramaic English New Testament (AENT), which includes a literal translation of the Peshitta on the left side pages with the Aramaic text in Hebrew letters on the right side with Roth's commentary. The AENT is basically a revision of the Younan Interlinear New Testament (from Matthew 1 to Acts 15) and the James Murdock's (Acts 15 and onward). Andumalil Mani Kathanar - Vishudha Grantham. New Testament translation in Malayalam. Mathew Uppani C. M. I - Peshitta Bible. Translation (including Old and New Testaments) in Malayalam (1997). Arch-corepiscopos Curien Kaniamparambil- Vishudhagrandham. Translation (including Old and New Testaments) in Malayalam. Janet Magiera- Aramaic Peshitta New Testament Translation, Aramaic Peshitta New Testament Translation- Messianic Version, and Aramaic Peshitta New Testament Vertical Interlinear (in three volumes)(2006). Magiera is connected to George Lamsa. Herb Jahn of Exegesis Bibles translated the Western Peshitto in Aramaic New Covenant. William Norton- A Translation, in English Daily Used, of the Peshito-Syriac Text, and of the Received Greek Text, of Hebrews, James, 1 Peter, and 1 John: With An Introduction On the Peshito-Syriac Text, and the Received Greek Text of 1881 and A Translation in English Daily Used: of the Seventeen Letters Forming Part of the Peshito-Syriac Books. William Norton was a Peshitta primacist, as shown in the introduction to his translation of Hebrews, James, I Peter, and I John. James Scott Trimm- Hebraic-Roots Version "New Testament". In Matthew, Trimmm utilizes the various Hebrew versions of Matthew and the Old Syriac texts. The other three Gospels are translated from the Old Syriac Gospels, while the rest of the New Testament uses the Peshitta. Trimm has been accused of plagiarizing The Way International's Aramaic-English Interlinear New Testament. Lonnie Martin- The Testimony of Yeshua. This is a revision of the Etheridge and Murdock translations. Joseph Pashka- Aramaic Gospels and Acts and Aramaic Gospels & Acts Companion. The translation includes both the Peshitta text (following he 1905 Critical Text) and a translation of it. The Companion transliterates the Aramaic text without vowels. Gorgias Press - Antioch Bible, a Peshitta text and translation of the Old Testament, New Testament, and Apocrypha. ↑ Sebastian P. Brock The Bible in the Syriac Tradition St. Ephrem Ecumenical Research Institute, 1988. Quote Page 17: "The Peshitta Old Testament was translated directly from the original Hebrew text, and most Biblical scolars believe that the Peshitta New Testament directly from the original Greek. The so-called "deuterocanonical" books, or "Apocrypha" were all translated from Greek, with ..."
↑ Geoffrey W. Bromiley The International Standard Bible Encyclopedia: Q-Z 1995– Page 976 "Printed editions of the Peshitta frequently contain these books in order to fill the gaps. D. Harklean Version. The Harklean version is connected with the labors of Thomas of Harqel. When thousands were fleeing Khosrou's invading armies, ..."
↑ Eberhard Nestle in Hastings' Dictionary of the Bible, IV, 645b. ↑ Francis Crawford Burkitt, Early Eastern Christianity, 71 ff. 1904. ↑ Bruce M. Metzger, The Early Versions of the New Testament: Their Origin, Transmission and Limitations (Oxford University Press 1977), p. 50. ↑ Andrew Gabriel Roth, Aramaic English New Testament, Netzari Press, Third Edition (2010), ISBN 1-934916-26-9 – included all twenty-seven books of the Aramaic New Testament, as a literal translation of the very oldest known Aramaic New Testament texts. This is a study Bible with over 1700 footnotes and 350 pages of appendixes to help the reader understand the poetry, idioms, terms and definitions in the language of Y'shua (Jesus) and his followers. The Aramaic is featured with Hebrew letters and vowel pointing. ↑ The Original Aramaic New Testament in Plain English, 6th edition 2011 has also Psalms & Proverbs in plain English from his Peshitta interlinear of those Peshitta Old Testament books, according to Codex Ambrosianus (6th century?) and Lee's 1816 edition of the Peshitta Old Testament. Bauscher has also published an Aramaic-English & English Aramaic Dictionary & nine other books related to the Peshitta Bible. The interlinear displays the Aramaic in Ashuri (square Hebrew) letters. Bauscher also has an Interlinear of the Peshitta Torah titled: The Aramaic English Interlinear Peshitta Old Testament (The Torah). Wikimedia Commons has media related to Peshitta. Wikisource has the text of the 1911 Encyclopædia Britannica article Peshitto.